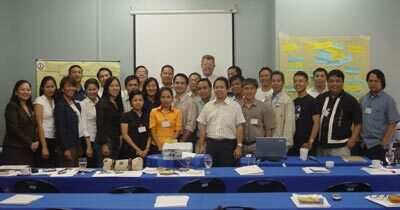 Local government officials from all corners of the Philippines attended the Friedrich Naumann Foundation’s first Liberal Leadership Training (LLT) workshop from August 30 to September 1, 2006 in Makati City. During the three-day activity entitled “Local Government and Liberal Politics,” the nearly 30 participants discussed the most important issues they face in their political work in local government today: economic development and poverty alleviation, the protection of the environment and cultural heritage, local finances and public services and the usage of modern information technology. During the workshop, successful local (and liberal) government officials presented best practices in various policy fields: Among the highlights was the presentation of Naga City Mayor Jessy Robredo who spoke on the topic of “New Public Management (NPM) in Practice”. According to the much awarded city mayor, one of the core aspects of NPM is “to bring the principles of the private sector to the public sector.” The mayor mentioned participation, transparency, professionalism and quality services as important elements of this modern governance paradigm. The great majority of the participants were elected local government officials, among them a governor, vice governors, mayors, vice mayors and councillors who belong to the Liberal Party of the Philippines.